Obsessed with anything red velvet? We are, too! 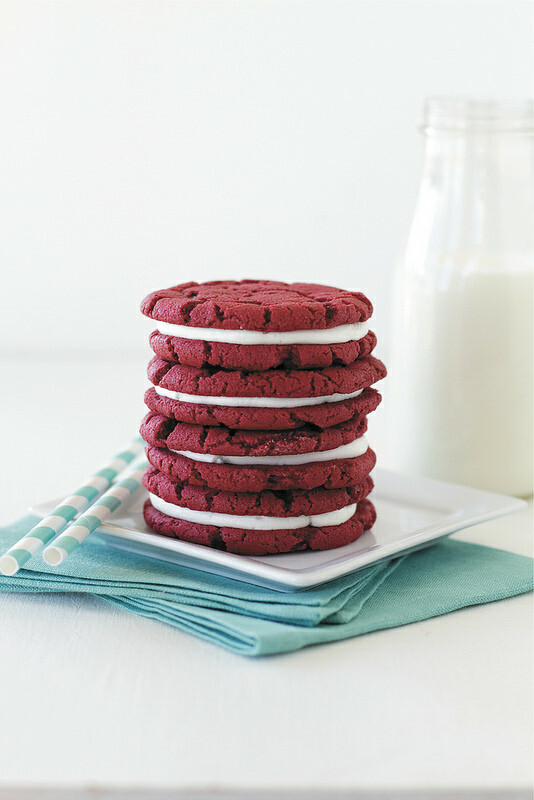 If your sweet tooth has a hankering for a treat, you’re going to love these Red Velvet “Oreos” from Deborah Harroun author of Red Velvet Lover’s Cookbook: Best-Ever Recipes for Everything Red Velvet, with More than 50 Scrumptious Sweet and Treats. Throughout this gorgeous cookbook (the only one of its kind completely dedicated to red velvet! ), Harroun shares easy-to-follow recipes for everything from classic red velvet cupcakes and cookies to cheesecakes, churros, shortbread, even pancakes and waffles. The full-color photography throughout will make you drool and want to don your apron. "My grandma had a cookie jar (shaped like a dog) that always sat on her counter. She wasn’t much of a baker, but there were always Double Stuf Oreos in that dog. It was a real treat to get an Oreo or two (or three!) when we went to my grandma’s house on Sunday nights. I can imagine how happy my kids would be if I kept a jar filled with these cookies on my counter at all times." To make the cookies: Position oven racks in the upper and lower thirds of the oven and preheat the oven to 375°F. Line two baking sheets with parchment paper. From the dough into balls (about 1 tablespoon each) and place the dough balls at least 3 inches apart on the baking sheets. Flattend the balls slightly with the bottom of a drinking glass. Bake until the edges start setting, 7 to 8 minutes. Cool for 5 minutes on the baking sheets, then transfer to racks to cool completely. To make the filling: Beat the confectioners’ sugar, shortening, butter, water, and vanilla in a mixing bowl with an electric mixer until light and fluffy. Place the filling a pastry bag fitted with a 1/2-inch round tip. Turn half the cookies over and pipe about 1 teaspoon of the filling onto the flat side of each cookie. Place another cookie on top of the filling, flat side down. Lightly press the cookies together to spread out the filling. Store in an airtight container for up to 3 days. Deborah says it’s easy to turn these cookies into ice cream sandwiches! Instead of the cream filling, fill the cookies with softened vanilla or cheesecake ice cream. Better year, fill them with her Cheesecake and Red Velvet Ice Cream (on page 97 of her book)! Wrap the sandwiches in plastic wrap and freeze until firm.